Our story begins with the need for play. Not just ordinary play but unstructured and imaginative outdoor play. Play that creates adventures and stories and memories. Play that teaches, inspires, and allows children to connect. At Grounds For Play, we encourage this delightful picture of play by truly understanding children and their developmental needs. We purposely design and create whole play environments that capture the spirit of an individual program and, ultimately, are safe for your children. Today, we rarely see unstructured play; it has been replaced with the need for higher test scores, video games, and organized activities. What a disservice that is to our children as studies show unstructured play brings about cognitive, emotional, social, and physical development. We at Grounds For Play know children are more than just little bodies. They have developing minds, growing personalities, and impressionable spirits, all which thrive in an unstructured play environment. Play is a valuable resource that is worth our time and attention, which is why our product designers and design consultants are built on an understanding of children, their development, and the value of play and safety. We dedicate time to ensure our products fully benefit children by taking into consideration their age and developmental needs, which is evident in every product we develop and every play environment we design. For children, play comes naturally – a rock becomes a dinosaur egg, a stick becomes a plane – but what if we offered children an opportunity to watch flowers grow, play a musical instrument, or dig up buried fossils in a play environment that was intentionally designed to capture the spirit and vision of your program? At Grounds For Play, we seek to encourage learning, peer interaction, and physical activity by creating whole play environments that address comprehensive issues, age-specific needs, and are centered on your objectives and curriculum. Our wide selection of products encourage the learning and developmental objectives of programs such as early head starts, head starts, Montessori schools, child development centers, public schools, and other programs just like yours, all while allowing children to learn new skills and discover new worlds. They say discovering new worlds and going on new adventures may be a little on the unsafe side – not with Grounds For Play. 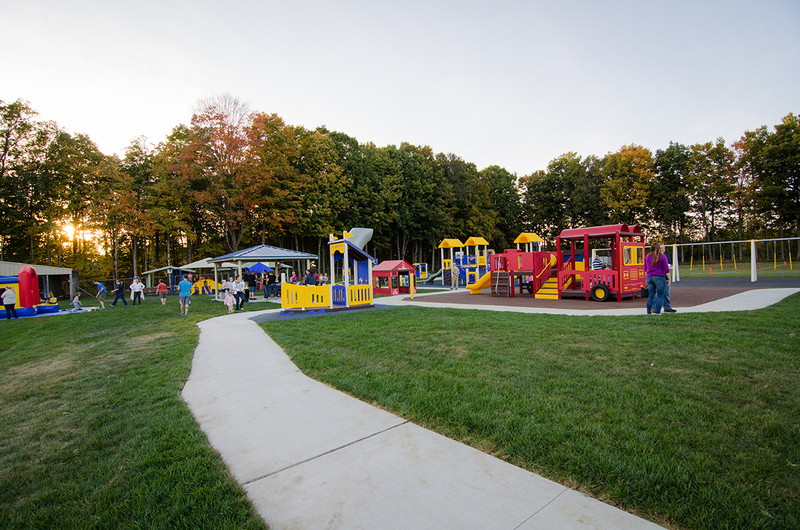 We pride ourselves in maintaining an extraordinary record of safety, which has allowed us to become the safest playground manufacturer in the industry. Our designers pay special attention to the play elements they design, ensuring each part and piece exceeds standards and recommendations set by organizations such as ASTM International and the Consumer Product Safety Commission. When your child steps into a Grounds For Play environment, know they are welcomed to a world of adventure designed in the safest way possible. Our story began with play and ends with you. Join us in our mission to create intentional play environments for children where they can learn, thrive, grow, and connect.